Are you looking for Central Kolkata’s famous Kali Puja pandal names & locations? Do you want to know what are the Kali Puja pandals of Kolkata should be visited? After discussing popular Kali Puja pandal names & locations of Barasat; now we are going to tell you most popular Kali Puja Pandals of Kolkata. Amherst Street Sarbojanin Kali Puja, Kolkata. Amherst Street Naba Yubak Sangha Kali Puja, Kolkata. 47 Pally Sarbojanin Kali Puja is one of the famous Kali Pujas in Kolkata. Kali puja happens at Md. Ali Park, Central Avenue (Kolkata); but 47 Pally Sarbojanin decorates C.R. Avenue with lights & LED lightings between Kalutola & M.G. Road. Main attraction of 47 Pally Sarbojanin Kali Puja is Bhog Prasad, distributed to everyone. Kali Puja of Kheyali Khelaghar, College Street is another oldest one in Central Kolkata. Kheyali Khela Ghar Sarbojanin Kali Puja of College Street has crossed 175 years successfully. Naba Rabin Sangha Kali Puja, Patuatola Lane, Central Kolkata. Sealdah Baithakkhana Pally Sarbojanin Kali Puja, Central Kolkata. Kali Puja of Anukul Smriti Sangha, Ganesh Chandra Avenue, Kolkata – main attraction Annakut Utsav. Kali Puja of Ekta Sangha, Bowbazar, Kolkata. Yuvasree Sarbojanin Kali Puja, Bowbazar, Shraddhanand Park, Kolkata. Balak Sangha Kali Puja, Shraddhanand Park, Bowbazar, Kolkata. These are the Central Kolkata’s famous Kali Puja pandal names & locations. You may start your Kolkata Kali Puja Parikrama either from Sealdah (By train easy to reach) or from M.G. Road Metro Station on Central Avenue (easy to reach by metro rail) and then walk through Amherst St., College St. etc. 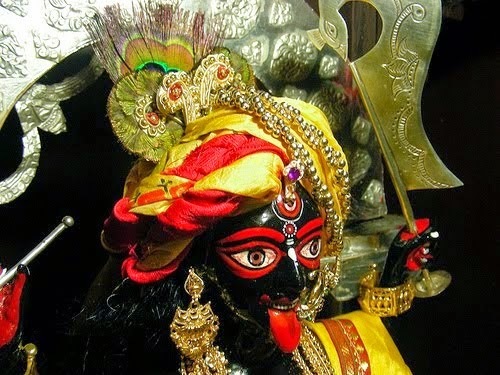 Don’t forget to visit Maa Kali Temples located in Kolkata like Thanthania Kali Mandir, Kalighat Temple, Dakshineswar Kali Temple etc. during Kolkata Kali Puja Parikrama. Barasat, located at the northern part of Kolkata & in North 24-Parganas district of West Bengal, is known for Kali Puja festival. 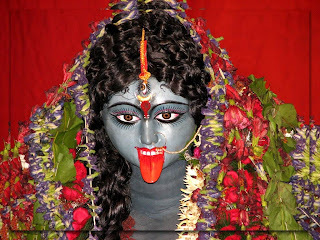 There are so many star rated Kali Puja celebrated in Barasat every year. Hundreds of Low budget, medium budget & high budget star rated Kali Puja pandals are there in Barasat. We have already discussed famous Kali Puja pandal names & locations of Barasat [Please check, popular Kali Puja pandal names & locations in Barasat]. Here we will give to an idea about Barasat Kali Puja route to follow to see most of famous Kali pujas. It’s not recommended to use car because of huge crowd. Walking is the best option from Barasat Railway Station. Route map of Barasat Kali Puja (Barasat Kali Puja Guide map) is here, save it in your mobile or memorize it. Then proceed one by one. Don’t worry Kali Puja pandal volunteers, policemen and local people are there to guide you during Kali Puja parikrama in Barasat. Don’t forget to visit popular Kali puja pandals of Barasat because every year they come up with new innovative theme either in Kali Idol or in Pandal. All the best, Happy Diwali. Barasat (Northern Kolkata) is famous for Kali Puja and here we are going to tell you Best Kali Puja Pandal names of Barasat that you should visit during your Barasat Kali Puja Parikrama. If you are looking for must visit & popular Kali Puja pandal names of Barasat and want to know which route to follow to cover most of all famous Kali Puja pandals in Barasat; then just scroll down. 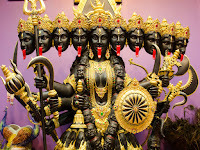 This year, you will get to see Maa Kali idol with Gold Tongue at Barasat and so many Kali puja clubs & committee come up with high budget theme in their Kali puja pandal in Barasat. Barasat Nabapally Sarbojanin Kali Puja Pandal will look like Bengaluru. It means, you will get to see Bengaluru in Kolkata at Barasat Nabapally Sarbojanin Kali Puja Pandal. If you haven’t seen Bangalore’s Krishna Lila Park then you must visit Barasat Nabapally Sabojanin Kali Puja pandal this year. Nabapally Sarbojanin Kali puja pandal is going to construct Bangalore’s Krishna Lila Park in Kolkata. There will be 3 huge temples (103 feet high) named Jagannath Temple, Narasingha Mandir & Venkatesh Temple at Kolkata’s Barasat Nabapally Sarbojanin Kali Puja pandal. It’s no doubt a must watch Kolkata’s famous Kali Puja pandal in Barasat area. One of the famous Kali Pujas in Barasat (Kolkata) is KNC Regiment of Barasat. Every year, they come with unique concept. This year, Barasat KNC Regiment brings Opera House of Paris in Kolkata. You should visit Barasat KNC Regiment Kali puja pandal to witness excellent art work on marble inside Opera House, Paris. One of the oldest Kali Pujas in Barasat area is Regiment Plywood Association, making a Temple of Rajasthan with spoons (chamach). Don’t miss out to see innovative Rajasthani Temple made of spoon in Barasat during Kali Puja 2014. Barasat Pioneer Club Kali Puja is very popular & attracts thousands of visitors every year. Pioneer Athletic Club is located beside Barasat Railway Station; thus it’s easy to go. Kali Puja Theme of Barasat Pioneer Athletic Club is Masroor Rock Cut Temple of Himachal Pradesh. A must visit Kali Puja pandal in Barasat. In front of the pandal, there will be Mela where kids can enjoy & people can do shopping as well. 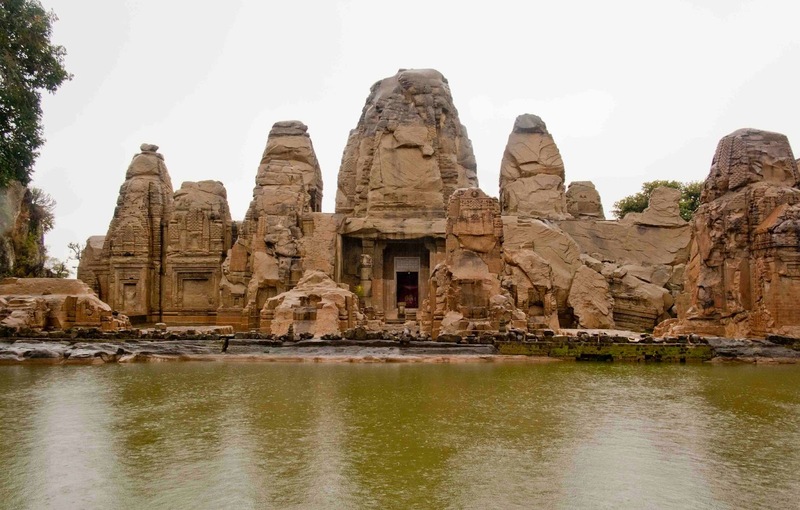 Don’t miss Masroor Rock Cut Temple of Himachal Pradesh at Barasat Pioneer Athletics Club located near Barasat Railway station. 2014 Kali Puja Theme of Barasat Sandhani Club is ‘Sun’. The Kali Puja Pandal will be looking like a Sunflower and Kali Idol seating on Sunflower petal. Beware of Bees, because Bees will be there on Sunflower. Barasat Sandhani Kali Puja pandal (Sunflower) is a must see one. If you want to see Maa Kali Idol with Gold Tongue & Silver Crown then you should visit Barasat Nabapally Bayam Samity making a huge Rajasthani Temple. Don’t miss to see Maa Kali Pratima with Gold Tongue (Sonar Jiv) and Silver Crown (Rupor Mukut). Visit Barasat Bidrohi Kali Puja pandal to see Church of Paris, symbol of peace. Inside the Paris Girja like pandal at Barasat Bidrohi Club; you will see an unique Maa Kali Idol that shows Dakshineswar Kali, Tarapith Kali & Kalighat Kali. So, don’t miss to visit Barasat Bidrohi Kali Puja pandal. One of the famous Kali Puja pandal of Barasat is Barasat Chhatradal where you will get to see an innovative Pandal made of Khejur Tree. Inside the Kali puja pandal you will see various stories of Ramayana. Barasat Chhatradal Kali Puja club is decorating the area with 3D LED Lighting showing ‘Ramakrishna Kalpataru Incident’, ‘Baul’ and ‘Buddha’. Barasat Pancha Pally, located at Noapara Check post, Kali Puja pandal will look like a South Indian Temple made of ‘Jhinuk’. Inside the pandal of Barasat Pancha Pally, you will see many scenes of Ramayana. Another surprise lies in Maa Kali Idol; you will see ‘Ravana Badh’ and ‘Ram Ji donating Eye’ beside Maa Kali Pratima in Barasat Pancha Pally Kali puja pandal. Vellore Swarna Mandir / Golden Temple of Vellore (South India) is the 2014 Kali Puja theme of Barasat Satadal Sangha, famous for creativity. Inside the Kali Puja pandal, you will get to see Ramayana & Mahabharat stories at Barasat Satadal Sangha’s Golden Temple, Vellore. You will get to see Kamarpukur-Jayrambati at Barasat South Bhatra Kali Puja pandal in this year. Barasat South Bhatra Kali Puja 2014 theme is Sri Sri Ramakrishna Deb & Maa Sarada’s birthplace i.e., Kamarpukur & Jayrambati in Kolkata. Barasat Taru Chhaya Kali Puja pandal is going to show you ‘Maithili Art & Culture’ of Mithila (Bihar). So, during your Barasat Kali Puja Parikrama 2014 include Barasat Taru Chhaya Kali Puja pandal as well. Kids (Children) will love this Kali Puja pandal because of Cartoon characters. Once you get into Barasat Samya Sangha Kali Puja pandal, you will see Chhota Bheem, Chutki, Kalia, Dholu, Bholu etc cartoon characters that kids love most. One of the popular Kali Puja in Barasat (Kolkata) is no doubt Barasat Shakti Mandir Kali Puja that makes ‘Gopal Bhar er Rather Mela’ theme. As the theme name suggest; you will get to see interesting things that had happened when Gopal Bhar visited Rather Mela. Barasat Shakti Mandir Kali Puja is a must visit during Barasat Kali Puja Parikrama 2014. Barasat Bamanmura Young Star Club Kali Puja pandal will be looked like a Rajasthani Temple. This Rajasthani Mandir looks like Kali Puja Pandal is made of Koyet Bell, Lobongo, Supari, Ellach & Jalpai. This is why; you should visit Barasat Bamanmura Young Star Club Kali Puja pandal to see amazing creativity. Barasat Aguan Sangha Kali Puja pandal will be looking like a 200 years old Rajbari. It will be a worthy enough visit to Barasat Aaguan Sangha Kali Puja pandal i.e., Raj Bari in Barasat. You will get to see a Temple of Birbhum (West Bengal) in Barasat Yuva Gosthi Kali Puja. Barasat Balak Vrinda Club Kali Puja theme is ‘Terracotta’. You will get to see a Temple of Bishnupur (West Bengal) at Barasat Balak Vrinda Club Kali Puja with full of amazing Terracotta art work. Barasat Kailashnagar Moitri Sangha Kali Puja pandal will show you ‘How nature affected by Science & Technology’. You will see Ajanta Hill (pahar) at Barasat Nine Star Kali Puja pandal. If you haven’t seen Ajanta Hill yet, then visit Barasat 9 Star Kali puja pandal as their theme is ‘Ajanta Pahar’. One of the famous Kali puja pandal in Barasat is Meghdut Shakti Sangha. ‘Birth of Durga in Lotus’ (Padmer Gorve Durgar Janmo) is the theme of Barasat Meghdut Shakti Sangha Kali Puja. Don’t miss to see this innovative creation by Barasat Meghdut Shakti Sangha Kali Puja committee. Kolkata is famous for Durga Puja & Chandannagar is popular for Jagadhatri Puja; just like this, we all know Barasat for Kali Puja. Above, we have discussed the most popular Kali Puja pandal names & locations in Barasat and now it’s the time to visit & see famous Kali Puja pandals in Barasat. It’s recommended to get down at Barasat Railway Station then walk from one to another Kali Puja pandals in Barasat. You may also get down at Hridaypur Station which is nearest railway station to Barasat Dakbunglow More. Madhyamgram is also not at all behind in creating unique theme during Kali Puja. If you have enough time, then watching Kali Puja pandals in Madhyamgram will also be worthy.